Honeymooners or getaway vacationers commonly choose the Garden Room. The room is located on the main floor of the home, is very spacious and comfortable. Furnished with antiques and collectibles including a mirrored antique chest of drawers and oversized chair with a side table. 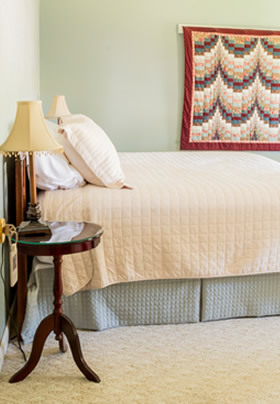 Settle in for a restful night in the king size bed with Comphy Company linens. Go to sleep with the crickets chirping and wake up to the sounds of birds singing. "This is the first time we stayed at a B&B. Wasn't too sure what to expect but we were greeted with open arms. I was at ease with Sandy. It was close to everything we wanted to do. So if you want a relaxing time, this is a great place to stay..."